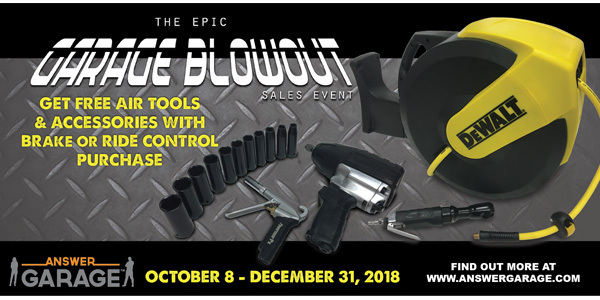 Ride Control LLC has announced the launch of its newest Answer Garage promotion: “The Epic Garage Blowout” sales event. 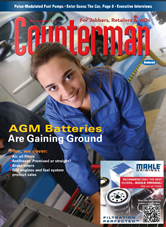 The promotion is open to all Gabriel and Bendix light-vehicle brake and ride-control consumers and service professionals in the United States. The Answer Garage “Epic Garage Blowout” promotion runs from now until Dec. 31. There’s no signup or membership necessary, although Answer Garage Membership is free for those who would like to join. Consumers or installers can earn tool bundles when they buy/install qualifying Bendix and Gabriel products and redeem online. See www.answergarage.com for details. “Epic Garage Blowout” bundles include tools such as air impact wrenches; SAE or metric impact socket sets; high-performance blow guns; 3/8-inch ratchet wrench; and premium enclosed air hose reels with 3/8-inch 50-foot hybrid polymer air hoses. Along with promotions, the Answer Garage offers technical support for consumers and service professionals at the toll-free Gabriel and Bendix Answer Garage Tech Line. In addition, shops can take advantage of the rewards, training and business tools. The program is offered for free to all professional installers. Visit www.answergarage.com for more details about the promotion.